postcolonial digital humanities with specific interests in Internet infrastructures, postcolonial computing, feminist digital activisms in the Global South. I locate my work in the socio-political context of India. 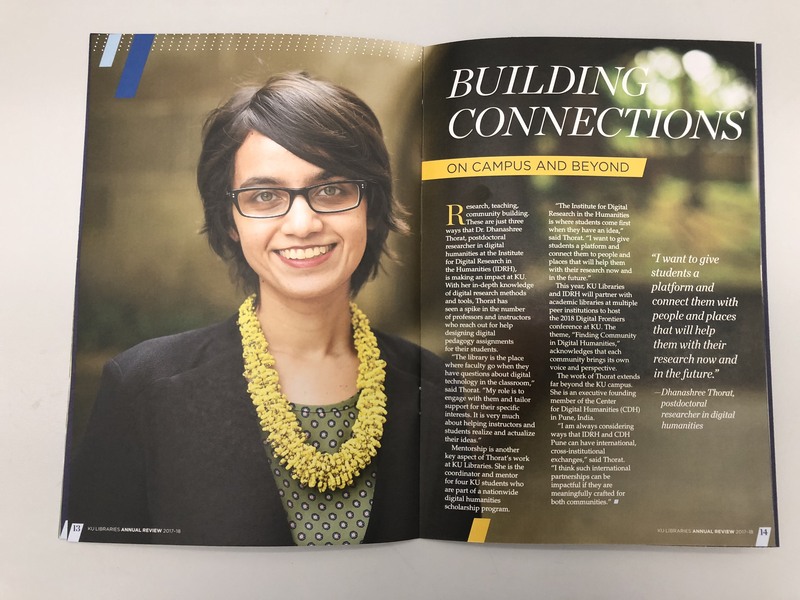 My work has been featured in KU News and in the KU Libraries Annual Review. [Revised and Resubmitted] Thorat, Dhanashree. “Colonial Topographies of Internet Infrastructure: The Sedimented and Linked Networks of the Telegraph and Submarine Fiber Optic Internet.” South Asian Review. Ed. Roopika Risam and Rahul Gairola. Special Issue Editor & Contributor, “Digital Humanities in India,” Asian Quarterly: A Journal of Contemporary Issues, 15.4 (2017): 4-12. [Accepted] Thorat, Dhanashree. “Digital Infrastructures and Technoutopian Fantasies: The Colonial Roots of Technology Aid in the Global South.” Digital Humanities in India. Ed. Maya Dodd and Nidhi Kalra.